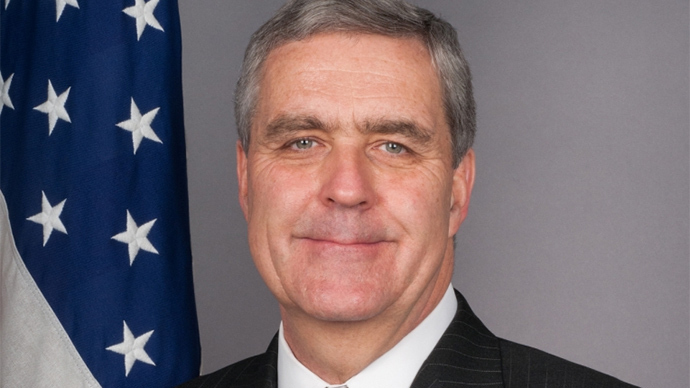 The US Permanent Representative to NATO, Douglas Lute, has admitted that his knowledge about the ongoing conflict in eastern Ukraine comes mostly from social networks rather than intelligence reports. “We should all ask ourselves: why is it that we know so little really about what is going on in Donbass,” the US ambassador to NATO told “Friends of Europe” forum in Brussels. “I mean, frankly, I read more on social media about what is going on in the Donbass than I get from formal intelligence networks. This is because the networks don’t exist today,” Lute said. The US envoy to NATO then backtracked, reacting to a comment made by Elena Donova, a member of the Russian delegation to NATO. The reliability of social media as a source of information has been questioned throughout the conflict in Ukraine. The latest example is an April tweet by US ambassador to Ukraine Geoffrey Pyatt claiming that Russia’s military were continuing to expand their presence in eastern Ukraine. As for proof, Pyatt posted a two-year-old picture of an air defense system from an air show near Moscow. Last July, Russia’s Defense Ministry questioned the authenticity of the satellite images of alleged shelling of Ukraine from Russian territory. It said the images were “created by US counselors” and posted by Pyatt on his Twitter microblog in an “informational merry-go-round” of fake pictures. In August, Russia’s Defense Ministry spokesman Major-General Igor Konashenkov ridiculed another so-called NATO proof, saying: “If earlier, someone would at least put their names on those images, be it Breedlove, Rasmussen, or even Lungescu, now, they are hesitant. It makes no sense to seriously comment on this,” he said. Yet, this February, Ukrainian MPs followed the line, presenting a US senator with photos of what they said were Russian military hardware columns on Ukrainian territory. However, it turned out that the photos had been taken during Russia’s conflict with Georgia in South Ossetia back in 2008. The Ukrainian conflict erupted in April 2014 after Kiev sent troops to the Donetsk and Lugansk Regions after civilians there refused to recognize the new coup-imposed authorities in the capital. The Minsk accords, brokered by Russia, Germany and France in February of this year, brought several weeks of calm to the region, but ceasefire violations by both sides have been growing, hampering the peace process. According to the UN human rights office, at least 6,116 people have been killed and 15,474 have been wounded during a year of fighting. Many fear that the true numbers could be much higher, however.